Located near Montana Tech, this Butte, MT hotel offers charming accommodations, well-appointed rooms, exceptional service and many nearby local attractions. Choose from standard rooms or select one of the suites, all offering cable television with movie channels, a coffeemaker, complimentary toiletries, Internet access and more. Each morning, get the right start to the day at this Montana hotel with a complimentary full breakfast buffet, including scrambled eggs, fresh fruits, bagels, hot and cold cereals, biscuits and gravy, coffee, tea, juice and more. Perkins Family Restaurant and Hops Pub and Casino are also located on-site at this Montana Best Western. Guests are more than welcome to take advantage of the casino, lounge, indoor pool, hot tub, exercise facility and fully equipped business center. The Best Western Plus Butte Plaza Inn also has services and space available for corporate events, meetings and banquets, accommodating up to 50 attendees. 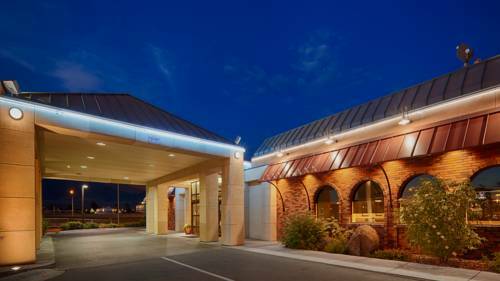 Located at the intersection of I-90 and I-15, this charming Montana hotel is only a couple minutes away from Our Lady of the Rockies and the Berkeley Pit. Many museums, theaters and historical attractions are near this Butte, MT hotel, including Mother Lode Historic Theatre, Uptown Butte Historic District, World Museum of Mining and Copper King Mansion. Also close to this Montana hotel are three golf courses. Skiing, fishing and hiking are also nearby. Located in the heart of local shopping and dining, there's never a dull moment when staying at this Montana hotel. Families will love that Discovery Ski Basin, Silver Bow Drive-Inn and All Seasons Adventures are also located within a short drive away from this Montana Best Western. For a stay in Butte, MT with friendly staff and bountiful amenities, make a reservation at the Best Western Plus Butte Plaza Inn today and save! From: Interstates 90 or 15. Take the Harrison Avenue Exit -Exit 127 South. The Best Western Plus Butte Plaza Inn is the perfect stop between Yellowstone National Park -150 miles- and Glacier National Park -225 miles. Struck by lightning, the touring circus elephant Old Pitt was buried where she fell in 1943.